Breast and ovarian cancers are ideal cancer vaccine targets for several reasons. Though perhaps not as immunogenic or responsive to immunotherapies as melanoma or renal cell carcinoma, evidence of endogenous immune responses exists in many patients with breast or ovarian cancer. A number of shared antigens or potential vaccine targets also exist between these two malignancies. Both tissue and tumor-associated antigens are known and, as both organs are dispensable, breaking self-tolerance to tissue-specific antigens is feasible. Additionally, adjuvant treatment for early-stage disease in breast and ovarian cancer is common. 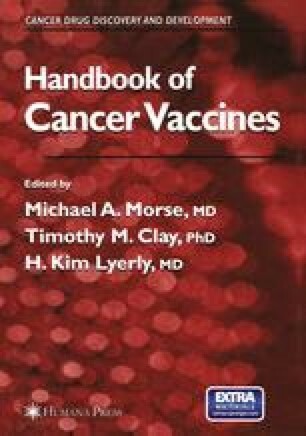 Since it is unlikely that cancer vaccines will eradicate large tumor burdens, vaccination of patients with low tumor burden will probably be most beneficial. Patients with breast cancer are often treated in the adjuvant setting when they have no measurable disease. Ovarian cancer patients are also typically treated aggressively after presentation and can often be rendered disease-free or with minimal measurable disease. Both groups of patients also have a significant and fairly predictable rate of relapse. Patients with breast and ovarian cancer also tend to be younger, healthier, and less immunocompromised by their cancer therapies than many other cancer patients. These diseases also affect large numbers of patients. Breast cancer remains the second leading cause of cancer deaths for American women, whereas ovarian epithelial cancer ranks fifth (1). For these reasons, breast and ovarian cancers are excellent targets for cancer vaccine development with readily available patient populations for testing new vaccine approaches.